21 Grams Per Servings! Increases Muscle Mass & Strength! 21 Grams Per Servings! Increases Muscle Mass & Strength!21 Grams Per Servings! Increases Muscle Mass & Strength! BLACK SKULL, Heavy Sports Nutrition, PUSSYCAT WHEY, 100% Concentrate Isolate Whey & Verisol, By Carol Saraiva, Delicious Chocolate, Natural & Artificial Flavors, Dietary Supplement, MADE IN THE U.S.A., BLACK SKULL PUSSYCAT WHEY by Super World Fittness Model Carol Saraiva is designed especially for women, it uses our Whey Protein Concentrate, made to keep the fat globule portion of the protein intact which preserves the integrity of the naturally occurring IGF-1 and IGF-2, our SRO (SpiroFuse Reverse osmosis) Whey Protein isolate, FOS that assists in the intestinal flora maintenance and the new GELITA collagen VERISOL technology. Collagen is the major structural component of skin, comprising about 80% of skin's dry mass. The skin's epidermis is affected by both dermal layer structure and environmental factors including aging, ultraviolet radiation, hormones and nutrition. VERISOL can slow these skin metabolism impairing processes responsible for the loss of collagenous extracellular matrix. Studies confirm those taking products containing the natural Bioactive Collagen Peptides of VERISOL, specially optimized for beauty applications, have noticeably firmer and smoother skin with fewer wrinkles. During the natural aging process, skin loses firmness, resulting in wrinkles and loss of elasticity. VERISOL slows this process effectively. 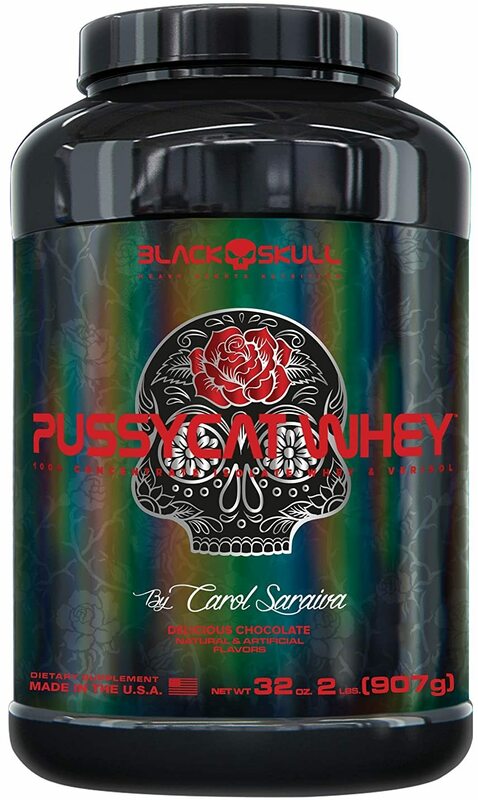 Offering what all women want, fresh young and soft skin, strong har and nails, and still getting strength and muscle mass, the BLACK SKULL team gave life to the best feminine protein of all times, The PUSSYCAT WHEY. BLACK SKULL is creating the future of muscle science, bodybuilding and performance enhancement for your success.